I pulled this old Liberty shirt out of my cupboard in Spitalfields to celebrate a sequence of bright days that convincingly proposed the notion of Spring this week. If you look closely, you can see the collar is wearing through but this does not diminish my affection for this favoured garment that I have worn for years now, bringing it out just for these early months when the temperature starts to rise. Though I am not a flowery person and most of the few clothes I own are of undecorated design, there is a gentle lyrical quality about this pattern that appeals to me strongly. When I wear this shirt with a dark grey or blue jacket, the colours really sing and I feel am doing my bit to participate in the seasonal change. For both men and women, the contrast of formal wear with a Liberty shirt can express dignified restraint while at the same time revealing a romantic attachment to flowers, plants, gardens and nature. A contrast that I recognise in my own personality. I love the conceit of having violets on my shirt when the violets in my garden are in flower and I enjoy the subtle tones of all the flowers portrayed, that remain as recognisable species while artfully stylised to make an elegant pattern. The evocation of the natural world in this simple design touches a chord for me and, as with so many things that trigger a powerful emotional response, I discovered that my passion for these floral patterns from Liberty goes back a long way. 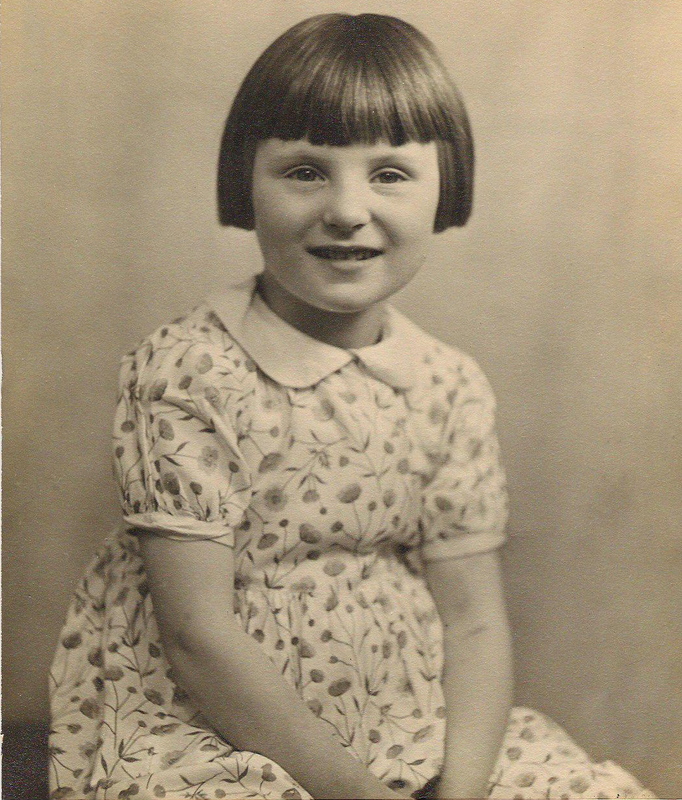 When I came across the familiar photograph of my mother Valerie as a child which you can see below, I did a double-take when I recognised the pattern on the dress. It was a Liberty print, very similar to my Spring shirt which I hold in such affection. In that moment, I recalled that my grandmother Katherine once bought fabric at Liberty in London and had it made up into dresses for my mother. This was a gesture which made such an unforgettable impression on my mother that for her whole life she carried her delight in these cotton dresses, which were so magical to her as a little girl in Somerset in the nineteen thirties. Floral prints fed her innocent imagination, nurtured on the Songs of the Flower Fairies and in performing as one of Titania’s attendants in a school play. A generation later, I grew up with the received emotion of this memory, a story my mother must have told me when I was a child. 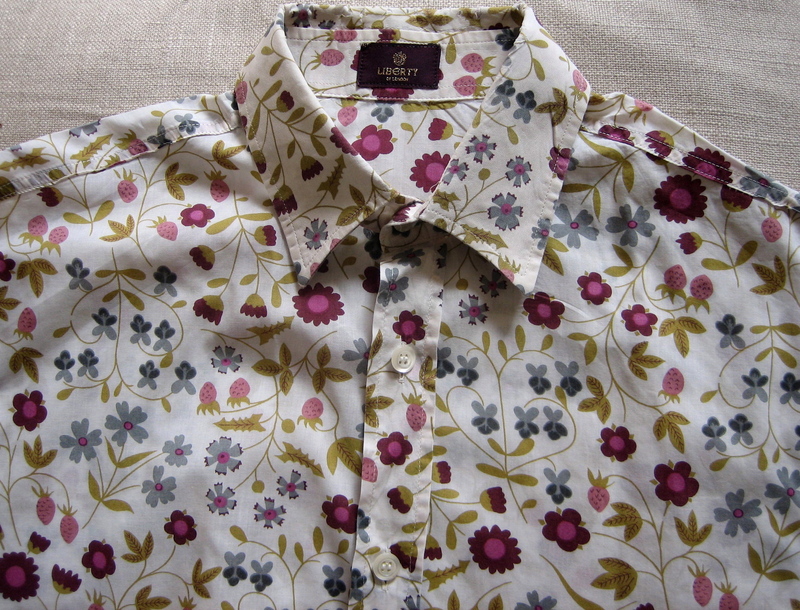 I thought I had forgotten, but I realised it was through an unconscious recollection of the photograph of my mother in the Liberty dress that I was attracted to this beautiful flowery shirt, without completely understanding the origin of my desire at the time. The story was confirmed when my uncle Richard moved out of the house where he and my mother grew up, and in my grandmother’s dressing table, I found a small leather pocket diary from the nineteen thirties recording her London trip with the entry, “Stayed at Claridges. Ordered carpet and sideboard at Harvey Nichols and bought materials at Liberty.” My grandmother was the daughter of a diminished aristocratic family who married my grandfather Leslie, a bank manager, and adopted an autocratic manner to ameliorate her loss of status. Consequently, my mother, with admirable resourcefulness, ran away from home at nineteen to escape my bossy grandmother and married my father Peter, who was a professional footballer – an act of social rebellion that my grandmother never forgave. Nevertheless, the taste I acquired for these elegant old-fashioned designs reflects the fondness my mother carried for that special moment in her childhood which she never forgot, when my grandmother showed maternal kindness to her little daughter in the gift of flowery cotton dresses. An act which came to represent everything about my grandmother that my mother could embrace with unqualified affection, and she encouraged me to remember the best of people too, a prerogative I claim in this instance as the sole living representative of these characters. Today, I wear my Liberty shirt as the sympathetic illustration of a narrative which extends over three generations, culminating in my own existence upon this earth, and as I button my Spring shirt, before walking out to celebrate sunshine and a new beginning, I am reminded that I alone carry these emotional stories now, clothing me in the humble affections of my forebears. Sometimes we’re told not to invest so much of ourselves in our physical possessions, but how can we not come to love and cherish the occasional article that evoke so many thoughts and memories? Further, sentimentality is not a fault unless carried to the extreme (when in fact it can be a symptom of an underlying problem). An appreciation of sentimentality is something which people often can’t appreciate until they have more years behind than ahead of them. Bravo, yet another article setting my synapses ablaze, thank you. .this is beautiful….i have a small stash of fabric from my childhood which evoke wonderful memories …and I know my daughters (all grown up) remember the dresses I once made them…threads of memories woven in fabric..love it!! What a lovely story: and collars can be turned, you know – it gives a shirt another however many years. My daughter now wears a decades-old Snoopy sweatshirt that I wore in high school, and it was saved because it was put in a bag of spattered clothes from painting my childhood home years ago. By the time I helped my parents clean out their garage for moving, that bag of old clothes was a time capsule, and I kept Snoopy. Now he’s worn again, paint spots and all. It’s not as classy as a Liberty print shirt or as exciting as the commenter’s black lace dress that was once worn to dance on tables in Australia (love that story), but it is a humble heirloom in our family. My saved clothes consist of a Laura Ashley long skirt in a wonderful lilac print bought in 1970 , definiteley won’t fit me now, and 2 long dresses also from the early 70s that I wore to college ‘balls’ . They were my first long evening dresses ( we used to dress ‘up ‘ not ‘down’ then !) and i’m glad i’ve kept them . My daughter has tried them on and I expect that she’ll be asking to wear them if there is ever a 70s party she wants to attend. Unfortunately, due to many moves in life I do not have any clothing heirlooms left, however, the sight of large check, pink and white gingham evokes a memory of a mother and child look alike competition we entered into one holiday wearing matching cotton summer dresses of this material. It was the 1960′s and we came second. I still have the photo’s so I have the dresses by proxy I suppose. I can’t look at gingham without this memory rising to the surface.